Most science centers are located in urban and suburban areas. As a result, they’re in a unique position to help their cities find ways to cope with climate change. This is more urgent for science centers in coastal areas, like New Orleans, New York and Miami, who are facing threats from sea level rise (SLR) at a rate faster than any of us could have predicted. Miami is one of the areas most at risk due to the fact that the city is low and flat; no area in Miami is higher than four meters above sea level! Already, a phenomenon called “sunny day flooding” is leading to tidal flooding in the lowest parts of Miami Beach. This is a result of the king tides, which are abnormally high tidal events that take place between the months of September and November. Absent of even a drop of rain, streets flood with salt water; in fact, an octopus was recently filmed swimming in a parking garage. Sea level flooding is only one consequence of urban climate change. As with any city, some areas are more at risk than others. In Miami, those areas with less trees and greater amounts of concrete face a double whammy from flooding due to heavy rain events and the heat island effect. These heavy rain events denote a change in Miami’s climate. Our regular cycle of convection-driven afternoon rain showers has given way to large rains that can last days. This makes us especially vulnerable to flooding. This past summer, the area around the Phillip and Patricia Frost Museum of Science received five inches of rain in just two hours, leaving concrete-covered areas flooded and stranding drivers in their cars. Heat island effect occurs when areas with less trees experience an extreme spike in temperatures due to the heat-trapping characteristics of concrete and the lack of vegetative canopy. Both of these phenomenon are most common in lower income neighborhoods, where concrete abounds and trees are scarce. Here in Miami, our political leaders have been much more cognizant of these risks than other parts of our country, with many of our mayors utilizing financial and personnel resources to combat these threats. Both the City of Miami and Miami-Dade County have created resiliency offices, complete with staff who are making recommendations to local governments on how to adapt. Greater Miami and the Beaches (GMB) is a member of the Rockefeller 100 Resilient Cities Program which is empowering cities to be active agents in adapting to climate change. A considerable sum of money has been spent trying to combat this issue. The City of Miami Beach recently spent hundreds of millions of dollars on a system of pumps that are designed to keep sea water off the streets of southwest Miami Beach. But there are steps we can take to fortify our coastlines without spending much money, and in the case of Miami, a science center is leading the way. Working under the leadership of Miami-Dade County’s Department of Environmental Resource Management which has restored hundreds of acres of coastal habitat around the county, Frost Science’s MUVE (Museum Volunteers for the Environment) project helps restore native coastal habitats using a team of dedicated community volunteers. These coastal habitats are also called living shorelines, as they use native vegetation to allay the impacts of SLR. Mangroves (of which Miami has three species), for example, are adapted to salt water. The floating seeds (called propagules) of the red mangrove can colonize new coastal areas and create new habitat. Their stilt-like roots keep the plants above the water. Together, these plants are well-suited to SLR. Using deep roots to stabilize sand and remain above the water line, dunes also serve as a great example of a living shoreline. Both mangroves and dunes do a much better job of withstanding rising waters than sea walls, which can easily overflow. 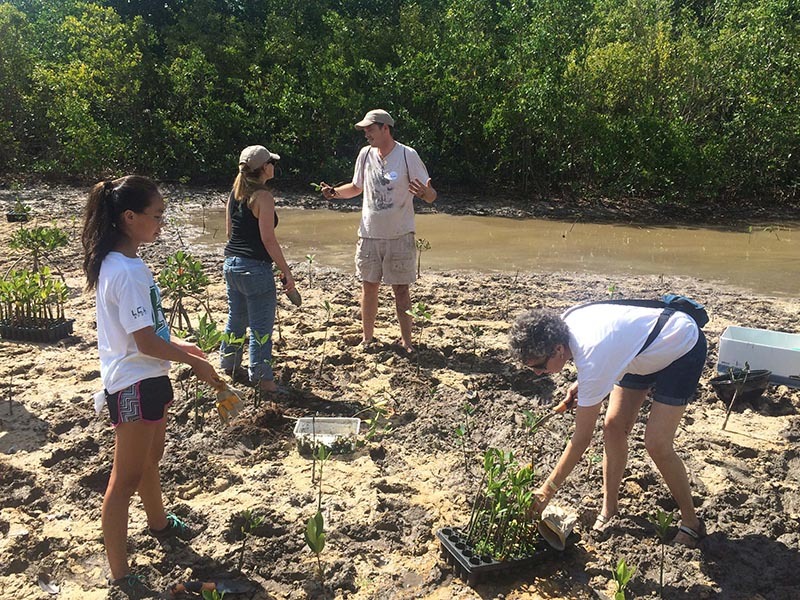 In October 2017, Frost Science, in partnership with the City of Miami and Miami-Dade County, received a $287,000 grant from Wells Fargo via the National Fish and Wildlife Foundation Resilient Cities program to restore three living shorelines. This will become the first of 100 coastal resilience demonstration sites around the city. In addition, the museum will be creating an original exhibition about SLR that aims to educate residents about how they can adapt to its threats. They will also be working with youth from three communities that are most at risk for SLR, heavy rain flooding and heat island effect to identify local champions and solutions, while creating videos about their experiences. These communities—including Hialeah, Little Haiti and Historic Overtown (located blocks from Frost Science)—are some of the most economically challenged and lowest lying points in the city. They’re places where concrete abounds and tree canopy is scarce.